The genesis of the NZCCA goes back to the 1920s. In those days A.O. Gray from Christchurch was an overseas member of the British Correspondence Chess Association. In 1932 Gray persuaded the BCCA to conduct a tournament for New Zealand players only. By 1933 he had sufficient members for such an event and in that year the first NZ tournament began. It was a double rounder and the competitors were A.O. Gray himself, H.R. Abbott (Christchurch), R.E. Baeyertz (Auckland), R.O. Scott (Wanganui), J.A.C. Barnes (New Plymouth), E.F. Tibbitts (Rotorua). Scott won this inaugural event and Abbott was second. Gray continued enrolling members and at the end of 1934 had 34 members of the BCCA in NZ. In 1935 Gray became Secretary of what was now the BCCA NZ Unit. Trophies were obtained and in March 1935 three trophy tournaments and a handicap event began. By 1938 there were 60 members, and at this point Gray decided that NZ were strong enough to run alone and so severed the connection with the BCCA except for remaining an affiliate of that body. When Gray died in March 1941 he left the NZCCA with around 60 members. G. Howard Brown of Napier took over as Secretary. Sadly, Brown passed away after he had been in office only one month. Then began a testing time for the NZCCA. J.F. Lang of Dunedin consented to fill the secretarial gap until other arrangements could be made. This period was in the middle of World War II. In August 1942 R.O. (Bob) Scott from Wanganui agreed to take over as Secretary. This he soundly did until 1946, when a work relocation saw Spenser Smith take over. Membership more than doubled in the late 1940s to a peak of 195 in 1950. In 1960, with membership having dwindled again to 80 members, a group of members from Auckland, led by A.L. (Alan) Fletcher took over and set about reviving things. It was during this Auckland period that membership of ICCF was finally sought. In 1978, at the age of 70, Alan Fletcher passed the Secretary role to J.W. (Sandy) Maxwell of Wellington, who still continues in this role today. Brett Sinclair, for many years the delegate to ICCF, and instrumental in getting NZ players into the international arena, now chairs the NZCCA. Membership has declined to around the 40 mark as the proliferation of internet opportunities expands. The NZCCA conducts an annual NZ Championship, with 3-4 supporting lower grade events. The 2011/12 events are the 78th editions. 1933 R.O. Scott; 1935 E.F. Tibbetts; 1936 J.T. Burton; 1937 S. Hindin; 1938 S. Hindin; 1939 S. Hindin; 1940 G.C. Cole; 1941 J.A. Cunningham; 1942 G.C. Cole; 1943 G.C. Cole; 1944 F.H. Grant & T. Lep & N.M. Cromarty; 1945 C.J. Taylor; 1946 R.W. Lungley; 1947 D.I. Lynch; 1948 D.I. Lynch; 1949 N.M. Cromarty; 1950 N.M. Cromarty; 1951 H.G. King & J.A. Cunningham; 1952 H.P. Whitlock; 1953 R.W. Park; 1954 J.A. Cunningham; 1955 E.J. Byrne; 1956 A.E. Turner; 1957 D.I. Lynch; 1958 R.A. Court & L. Esterman; 1959 R.A. Court & J. Eriksen & J.A. Cunningham; 1960 J.A. Cunningham; 1961 F.A. Foulds; 1962 R.A. Court; 1963 J. Eriksen; 1964 F.A. Foulds; 1965 O. Sarapu; 1966 R.S. Wilkin & R.A. Court; 1967 J.H. Patchett; 1968 O. Sarapu; 1969 O. Sarapu; 1970 R.J. Sutton; 1971 P.A. Garbett; 1972 K.W. Lynn; 1973 D.A. Flude; 1974 T. van Dijk; 1975 L.J. Jones; 1976 P.A. Clemance; 1977 L.J. Jones; 1978 R.W. Smith; 1979 M.R. Freeman; 1980 R. Chapman; 1981 R. Chapman; 1982 P.A. Garbett & T. van Dijk; 1983 M.R. Freeman; 1984 M.R. Heasman; 1985 P. van Dijk; 1986 G.M. Turner; 1987 P. van Dijk; 1988 H.P. Bennett & M.F.Noble; 1989 H.P. Whitlock; 1990 P.W. Stuart; 1991 R.J. Dive & P.W. Stuart; 1992 M.G. Hampl; 1993 R.J. Dive; 1994 G.B. Banks; 1995 M.G. Hampl; 1996 B.F. Barnard; 1997 B.F. Barnard; 1998 B.F. Barnard; 1999 T.J. Doyle; 2000 A.J. Short; 2001 M.L. Dunwoody; 2002 M.L. Dunwoody; 2003 P.B. Goffin; 2004 R.E. Gibbons; 2005 R.E. Gibbons & M.F. Noble; 2006 H.P. Bennett; 2007 H.P. Bennett & M.F. Noble; 2008 M.F. Noble; 2009 M. F. Noble; 2010 M.F. Noble. In the international arena, NZCCA has four members who have been awarded International Correspondence titles by ICCF. In 1989 Roger Chapman from Wellington received the IM title at the London congress. 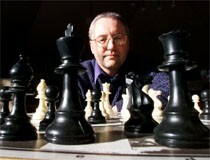 Mark Noble, also from Wellington received the IM title at the 1992 Graz congress, the SIM title in 2007 and the GM title in 2010. The Gjøvik congress in 1995 conferred the IM title upon Michael Freeman from Midhirst, and the SIM title in 2003. Brian Anderson of Christchurch was awarded the IM title in 2008 and the SIM title in 2010.